Some highlights from BATV is Haunted 2016. The 2016 Billerica Memorial Day service filmed on the steps of the Billerica Town Hall. The 2016 Billerica Memorial High School graduation. Filmed at the Tsongas Arena. Jack Morris interviews Dean Santoro, Candidate for Billerica Planning Board. Kim Conway, George Simolaris and Ed Giroux, Candidates for Billerica Board of Selectmen, are interviewed. Mark Efstratiou, Daniel "Bubba" Goodwin, and Jim Gately, Candidates for Billerica School Committee, are interviewed. Intros created by kids from the BATV Youth Programs for the 2016 LNT Halloween Movie Marathon. History projects produced by students in Michael McCarthy's history class. Filmed at the First Parish Church in Billerica, MA. The 2016 Shawsheen Tech Graduation. Coverage of the 2016 Yankee Doodle Parade in Billerica, MA. A compilation of programs produced by the 2017 BATV Summer Youth Programs. 2017 Billerica Candidates' Debate at the Council on Aging. Coverage of the 2017 Billerica Yankee Doodle Parade hosted by Cosmo Cavicchio and Art LaCroix. Produced by Adria Orenstein for the 2017 Boston 48 Hour Film Project. Rampage Trio performs at Billerica's Concerts on the Common series. A look at the Shawsheen Tech open house for prospective students. In case you want to relive the magic: The 2017 Solar Eclipse live from the rooftop of BATV. A short promo for BATV's first ever Kindness Film Festival. Help us spread the word! Entries from the 2018 BATV Kindness Film Festival. Thanks to everyone who participated! 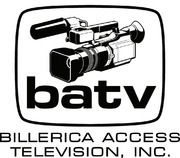 Films produced by BATV's summer video clubs.